With almost a week of potty training under our belts, I think I can safely say that Collette is potty trained. OMG! 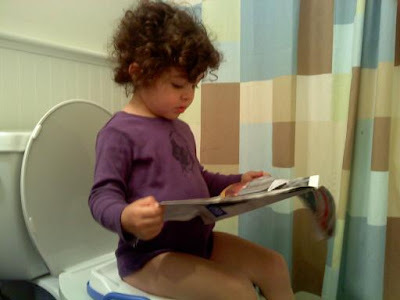 I wish I could share with you all the secrets to successful, stress-free potty training. Alas, I have no secrets. I think we just got lucky on this one. After the few accidents she had on Day 1, it clicked. She asks to go when she needs to, with plenty of time to get to the potty, get pants off and get her on the pot. False alarms are far fewer now (although we still have lots). And she is waking up dry from nap and overnight. I know. It's not even fair. Poop, though - that's another story. So, number 2 is still an issue. She has only gone twice since we started on Monday - once in her nap time diaper on Wednesday and the aforementioned incident. I have heard from so many moms that this is pretty standard so I'm not going to worry about too much for now. I'll keep you all posted though - I'm sure you'll be dying for Collette's BM updates. All in all, I have nothing to complain about. This was way easier than I thought it would be. Does this mean it will be hell training Sebastian??? Please don't say yes. You're too funny! Hopefully you've got two (or three!) easy trainers! I have the opposite problem. Gemma tells me when she has to poop on the potty but can't seem to tell me when she needs to pee. Instead she tells me as she is going pee in her diaper. @Robyn: that's why I like the 3-day potty training approach. You go straight to undies and the idea is that the accidents will help them learn. At least that's how it worked for us. I have the e-book PDF if you'd likeme toenail it to you. That's awesome. I wish at least one of my 3 would be ready. It just doesn't seem like anyone has any interest. I'll just have to keep trying and hoping that it will work some day! Matteo's 9 month stats, etc.